I am comparing geometries of input layer and output layer features. I want to delete features in output layers which has equal geometry to input feature. I am using following code to do that. This code deletes features in output layer but while removing output layer from the Qgis desktop, input layer geometries disappears but features are there in attribute table. What changes can I make in the code to make it work properly? Here I am adding an image to make my doubt more clearer. Here, "drain"is an input layer which is open in Qgis screen, it has attributes but features are not displayed(or visible) on the screen. It was coming correctly before executing the code given above. Working directly on the layer has the advantage, that all internals of QGIS are notified about changes/deletions, whereas changes on the data provider just happen, but QGIS will have no information about that internally (just as if those changes would be done completely outside of QGIS). 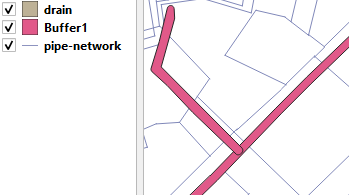 So any cached information inside QGIS (like in the attribute table) will still be there until loaded next time. layer.updateFeature() will apply any geometry or attribute changes you have done to you your feature to the data source. Since you have just deleted your feature there is nothing there to update any more. It's not required if you work on the data source, but if you work on the layer, it needs to be editable. Not the answer you're looking for? Browse other questions tagged pyqgis qgis-3 features or ask your own question. Copying Multiple Selections (by Attribute) to One Output Shapefile using QGIS Python scripting? Executing intersect algorithm with pyqgis?